When a customer gives you their email address, it's an invitation into a space where they spend a lot of time. You get the invite because you've made a connection and piqued the interest of your customers. That's why your customers decide they want to hear more from you. From welcome emails to follow-up emails, it's this access and connection that make emails so powerful. This is especially true for referral emails. When you send referrals to the right set of customers, you set yourself up for long-term growth. But even though referral emails are an effective way to reach new customers, your advocates won't always read your emails. It's one thing for customers to open your email but another for them to take action. One way to get customers to act on your referral emails it to incorporate tactics that make video games so addictive. People spend countless hours playing them so why not create emails that grab and hold the attention of your customers? This is the essence of gamification, using elements of game design in non-gaming environments to improve user experience. Of all the different types of referral emails you send, scoreboard emails are perfect for gamification because they're meant to track stats. A potentially boring email can get an immediate boost with a few fun elements thrown in. A potentially boring email can get an immediate boost with a few fun elements thrown in. But how exactly do you make emails addictive? Here are the answers and some ideas of how to create scoreboard emails that advocates follow-through on. And, a little note about program design. Some of the examples below involve tiers and levels which are essential elements of gamification. In almost every case, the goal with referral is to engage as many advocates as possible as quickly as possible. Complexity, as represented by tiers, often runs counter to that goal. So, including these examples is for inspiration, not emulation! You don't have to be a gamer to know that video games are addictive. People wait in line for hours to get their hands on new releases and then spend hours playing them. This combination speaks to both the curious and competitive side of players. Players want to beat the latest high score, find out what adventure lies on the other side of every mission, and discover what new challenges they'll face when they level up. It's this anticipation that makes video games so addictive. Marketers have been tapping into video game design for inspiration for a long time. You see it in progress bars, leaderboards or contests in apps and campaigns. In emails, game design has evolved into another way to get people to stop and take notice. Gamification takes elements of game design like rewards, leveling up, leaderboards, achievements and progress bars to hook customers and keep them engaged. 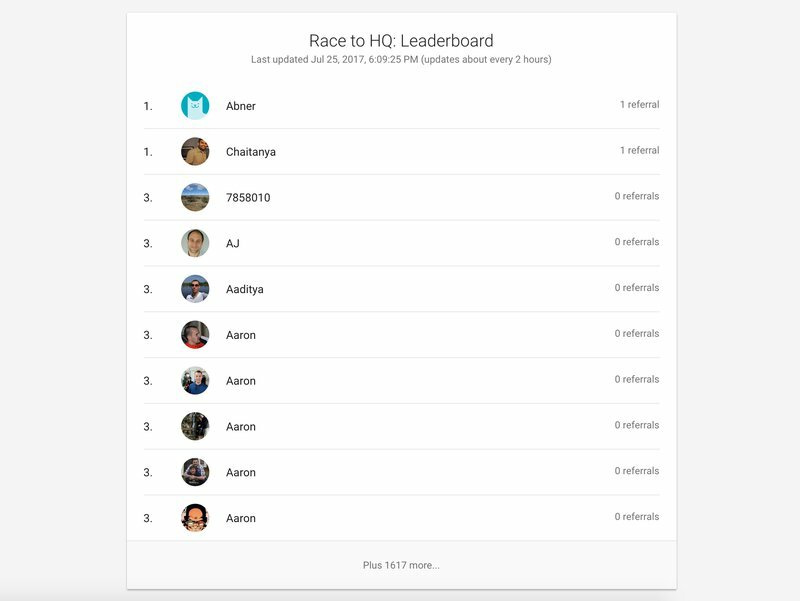 Let's looks at an example of how gamification works with referral marketing. 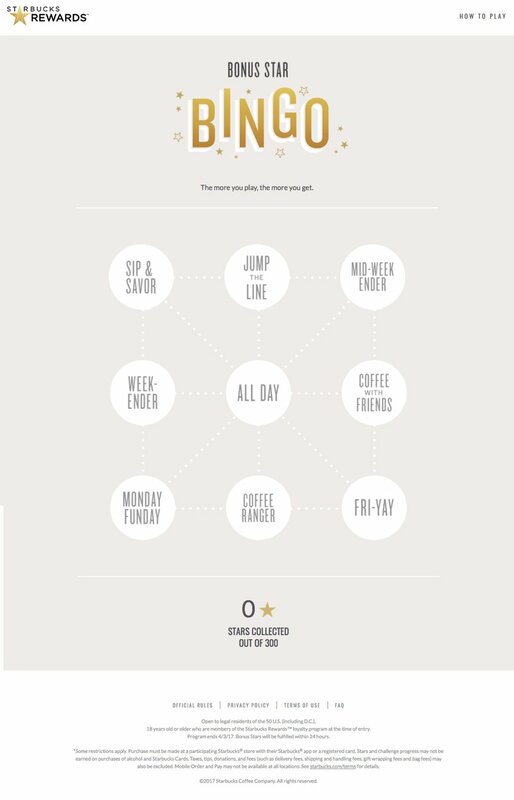 Earlier this year Starbucks ran a Bonus Star Bingo promotion to get customers to buy more. Instead of sending a text only email asking Starbucks reward members to buy more stuff in exchange for points, customers were given access to a virtual bingo board. The more customers “played” the more chances they had to earn up to 300 bonus stars. Customers can then redeem the stars for any food or drinks at their local Starbucks. This campaign was a simple, fun and engaging way to get people into the loyalty program and understand how it works. The same thing applies to your scoreboard emails. Use these emails to inject some fun into the referral process and increase the chances of advocates referring their friends. But gamification is more than throwing a bunch of gaming concepts into your emails. For gamification to work, your campaigns need a specific focus. For example, find out what your advocates value. Do they value saving money, reaching new levels in a rewards program or getting something for free? Whatever the value is, your gamification efforts have to highlight that. If advocates like to track the rewards they get for sharing, it makes more sense to create an email that shows them how to level up instead of a random scratch and win email. Here are some examples of successful campaigns to get you started. An important part of games like Minecraft, World of Warcraft and even the latest Super Mario Odyssey, is the number of rewards and points players can rack up. Accumulating rewards and points is what keeps a lot of players engaged. Lots of advocates share referrals because the reward appeals to them. For example, advocates at Starbucks get free food and drinks when they collect 125 stars. Advocates at ShopKicks get “Kicks” that translate into dollars that can be used towards purchases. If your advocates put value in the rewards they can get, use gamification to show advocates how close they are to getting a reward. Do this to encourage them to keep sharing. 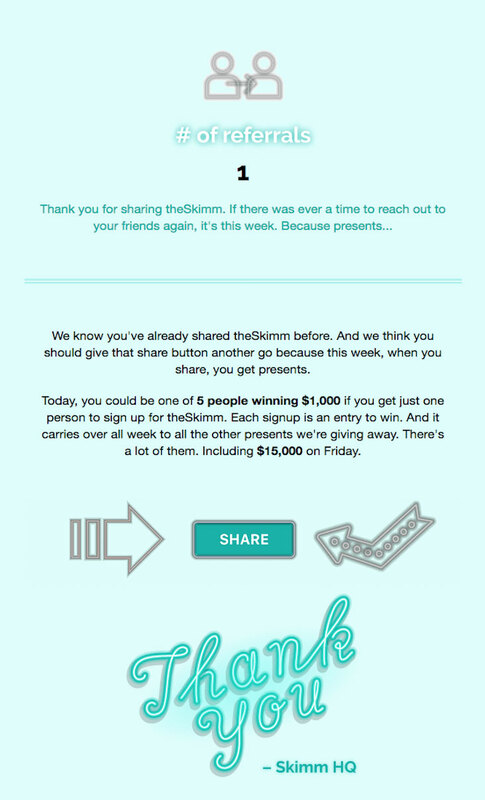 The scoreboard email that TheSkimm sends its subscribers explains what each advocate gets when they refer friends. The email gives an overview of what the advocate has done so far and acknowledges previous referrals. 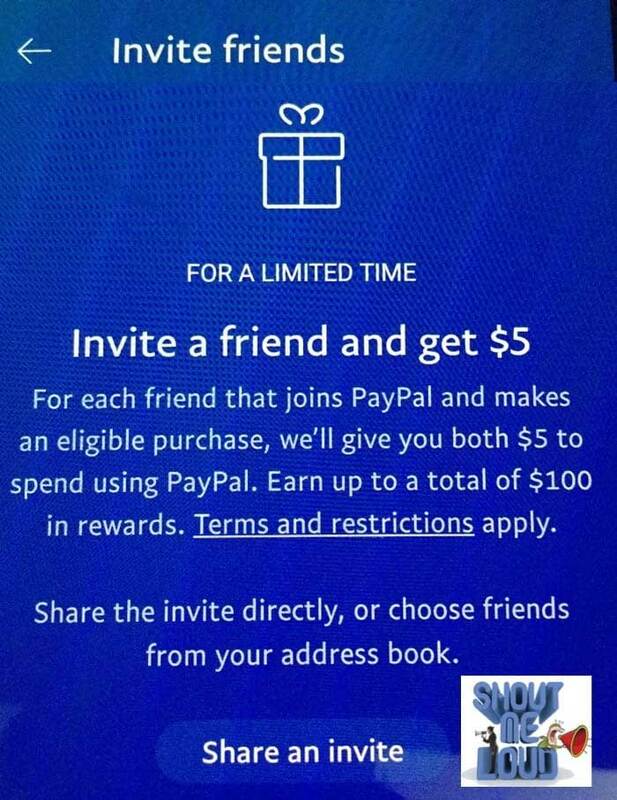 The email also provides more detail on how to win $1,000 by sharing one more referral. It ends by drawing attention to the call-to-action button that immediately gains attention and gets advocates to share. The advocate has to do something — like reach a certain number of shares — in order to get the reward. Variable rewards change over time. 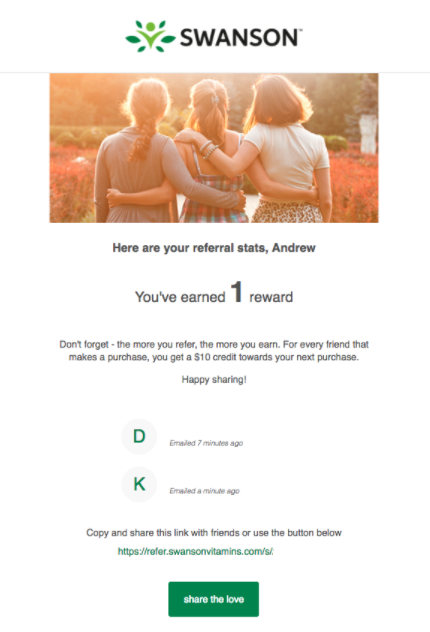 For example, Airtable gives users a $10 credit every time users refer someone. Airtable could make the reward variable by offering access to premium service for a limited time for referrals. The offer isn't dependent on the number of shares but is instead offered at a point in time. Once you decide on what kind of reward to offer, add in your gamification. For example, if you want to promote variable rewards, include a spinning wheel — kind of like the one in The Price is Right — and let advocates click on it to spin. Wherever the dial on the wheel ends, that's the reward the advocate gets for sharing. There's a lot on the web about how rewards triggered at variable intervals keep people engaged for longer periods of time. Because people don't know when the next reward is going to come up, they keep participating in the hopes that another variable reward will be presented. Consider using a mix of fixed and variable rewards in your emails to keep advocates engaged. A huge part of most games is the chance for players to level up. Every time players complete a set of tasks in each level, they move up to the next one and start the process again. The goal is to keep moving up until they reach some predetermined milestone to win the game. Scoreboard emails that include tiers and leveling up motivate people to keep pushing forward. Advocates can see the next step and know want to do to get there. For example, if advocates get five more referrals they can move to the next level. 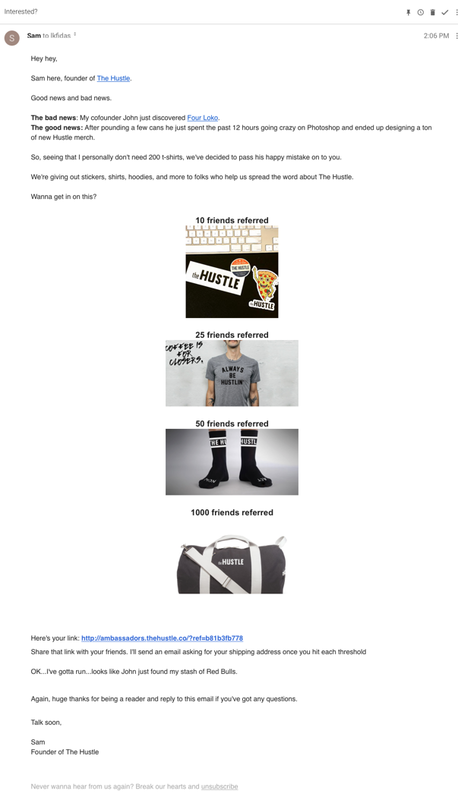 The Hustle, a tool that curates tech news daily, uses tiers in a fun way. They set the scene with a quirky anecdote to keep people reading. Then comes the tiers with each one showing how many referrals are needed to get a branded item. This appeals to advocates who value branded products. They're encouraged to keep sharing as they go up a level and the get access to different products each time. Use leveling up to turn your scoreboard email into a game and nurture “super advocates” who really love your brand. By seeing products that they want and what it takes to get them, these advocates are more engaged and likely to keep sharing. If some advocates are close to a level, get them excited about the prospect of the pending reward. Better yet, if advocates have already reached a tier, remind them of how much their effort is appreciated and the good feeling they felt having accomplished something. This will be the encouragement advocates need to share until they reach another level. If you've ever played a video game, then you know that leaderboards are an important part of all games. Leaderboards encourage more referrals over time. If you regularly show advocates a leaderboard, it helps nurture more sharing. Advocates want to outperform other people. When it comes to your scoreboard email, use leaderboards to show advocates where they are compared to other advocates. For example, send this email to advocates who are amongst the top 100 referrers. Make a big deal out of it to encourage your top advocates to keep sharing. You can embed this in your emails to show advocates how they rank against others. Remember, the purpose of the scoreboard email is to show advocates what they've done so far. This can include stats like the number of total referrals to date, how many referrals have followed through and total rewards the advocate has received. The leaderboard takes this information and compares it to other advocates. Just like a video game, this ranking of top performers is meant to kickstart some competition. Take the idea of leaderboards one step further by showing top-ranked advocates on social media. For example, once a month, choose 10 advocates who've shared the most referrals and do a spotlight on Facebook. Include their name, the number of referrals they've shared and any rewards they've received as a result. The benefit of doing this is two-fold. Advocates get to see how they compare to others. This encourages them to share more in the hope that they'll be featured in the future. A lot of video games have dashboards that act like data hubs. Your scoreboard email does the same thing. But instead of listing out information, use it to show rankings and status. Advocates want to feel as though their efforts accomplish something so use your scoreboard email to highlight how well advocates are doing. This is exactly what Swanson does with their scoreboard email. The email reminds advocates of the benefits of sharing referrals and lays out what's been accomplished so far. The email doesn't have to go into a lot of detail, it just has to highlight the most important information. This particular referral program is based on rewards. The more advocates share, the more rewards they accumulate to use towards their own purchases. The email shows rewards earned to date and which referrals contributed to it. It's also a good idea to show how many referrals have been invited so far and how many of those referrals have followed through. For advocates who value setting and reaching goals, set your email up like a dashboard to get advocates' attention and celebrate their achievements. In video games, progress bars are used to show players things like how many rewards they've racked up or how many missions they've completed. The point of the progress bar is to give players a quick snapshot of where they are in relation to their next reward. Engaged advocates are the same. They want to know how well they're doing and how much progress they've made. Knowing they've reached their goals keeps them engaged and sharing. Adding a progress bar to emails highlights your advocates achievements in an entertaining way. You can take a reminder email like this one and add a status bar at the bottom. Insert a progress bar with reward tiers for each level — the more rewards an advocate gets, the more exclusive the rewards get. Advocates can see available rewards and where they are along the status line. Every time you send an email update, the status line moves to track how far along advocates are. This is a great way to encourage advocates to keep moving forward. To be effective and keep advocates excited about their progress, only include a few steps. Include too many and the end goal seems unattainable. Advocates give up because they don't see any way to meet the expectations of the program. Don't use more than four or five steps in your progress bar if you want to keep advocates engaged. The purpose of gamification is to add some fun to a user's experience. You already send “scorecard emails” to update advocates on their referral progress and to get them to keep sharing. Use these emails as an opportunity to get advocates excited about your referral program. But in order to get the most out of your emails, take the time to get to know who your advocates are. Emails shouldn't be one size fits all. Different people value different things and have a different preferences. The more you cater to these differences, the stronger your referral campaigns will be.